There are about 1.5 million apps in the iOS app store, 1.6 million in Google Play and another 800k apps in the Amazon and Windows stores. As an app user, I have a lot of options to choose from for every mundane task. As an app developer, I should be excited to be a part of such a buzzing ecosystem. But is the reality anywhere close to the hype? Recently I realized that I haven’t visited any app store in the last year and every friend I asked couldn’t remember the last time they had been to the app store to "discover" a new app either. That got me thinking – Do we need app stores anymore or can we live without them? The colossal number of apps in app stores have led to a huge discoverability problem for users and app developers alike. 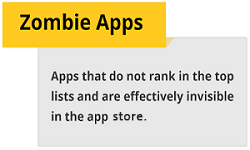 The uncontrolled explosion of apps has resulted in a lot of "Zombie Apps". 83% of iOS apps are in a Zombie state at present. If this trend continues (and nothing indicates it wouldn’t), we’ll see less than 10% of all apps attracting any kind of user attention, and those that do will already have significant traction to be listed in the top 10s in all stores. App count in the iOS app store increased by 50% in 2014. During the same time Zombie apps increased by a 100%. With no sign of a slowdown in the growth rate of mobile apps, app stores will become increasingly crowded and only those with big brands and budgets will be discoverable. Users will not be able to discover new apps and as a result new and budding app developers will lose out. How do you get discovered when you have one app in the sea of a million apps? It is almost like finding Waldo. 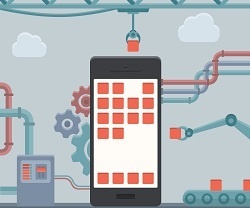 App store curation and app ranking was not designed keeping app developers in mind. It was and still is designed to help users discover and acquire apps. That poses a huge problem for app developers. To be fair, blaming the app store for poor discoverability is like blaming Google for not putting my personal website on the first page. Getting discovered is the responsibility of the creator and not the app store or the consumer. So how does anyone discover your app? The answer is fairly simple – pay hard cold cash. Multiple forms of ads can help your app stand out, but they are an expensive fix for a broken model. Boost campaigns used to be one of the most common ways to build up an app’s user-base in a short space of time, but now the average cost of buying an app install (factoring the cost of purchased installs and organic growth) is about $1.5. Moreover, an app probably needs approximately 50k-100k downloads to come up to the top 10 charts in different markets to gain visibility. That puts the immediate cost of discovery at $75k – $150k. For instance, Clash of Clans reported a revenue of $1.7 billion in 2014 while it spent $450 million on marketing. Apple declared that it had paid $40 billion to developers since the App Store opened. Add to this the fact that the store was responsible for "creating and supporting" 2 million US jobs. More than half a million iOS developers have created apps. Between iOS, Android, and smaller platforms, apps could generate $101 billion annually by 2020 (according to the market research firm App Annie). But the “middle class” in app stores is small and shrinking and easy money is gone. Approximately 85% of all iOS app revenues went to games - another worrying sign for app developers. At the same time, trends are shifting fast. In 2011, 63% of apps were paid downloads, selling for an average of $3.64 per app, while in 2015 a mere 27% of downloads were paid, and the average price had fallen to $1.27. To make profit in the app store today you need a complex mix of in-app purchases, subscriptions, and advertising. This is out of reach for the “middle class” of app developers. Trends show that more consumers use an app intensely for a very short period of time rather than using it regularly over a long period and hence app loyalty (or app stickiness) is declining. Exhibit D – Do I need multiple apps anymore? Forget the app stores, let’s look at the most popular apps that we use on a day-to-day basis. The first thing you will notice is that all these are native apps. Hybrid apps do not even make the elite list. The most interesting thing about this elite list is that all these apps are essentially every day tools we use for communication. Interestingly, app platforms such as Facebook, Twitter, and WeChat are integrating a vast array of services in themselves. The future is multi-service messaging platforms - meaning we should be able to chat from Facebook, video call from Facebook, buy from Facebook, bank from WhatsApp, make calls from WeChat, read news from Twitter, and share photos from Instagram. So, why do we have so many apps in our mobile phones? We don't need them. Consider a state where the “usual big apps” supported by the OS vendors provide integrations with services that people generally use. For example, nothing stops Google Maps from integrating with Ola, a cab aggregator and BigBasket, an online grocery store in India. Once this happens, the need for "one app for one task" ceases to exist. Less is more for today’s app users. The more uncluttered their mobile screens the better. 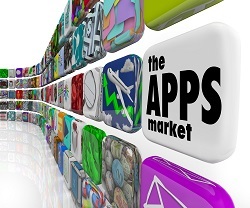 With user behavior changing rapidly, is the time ripe for an "Uber moment" for app stores?